4 of 6. 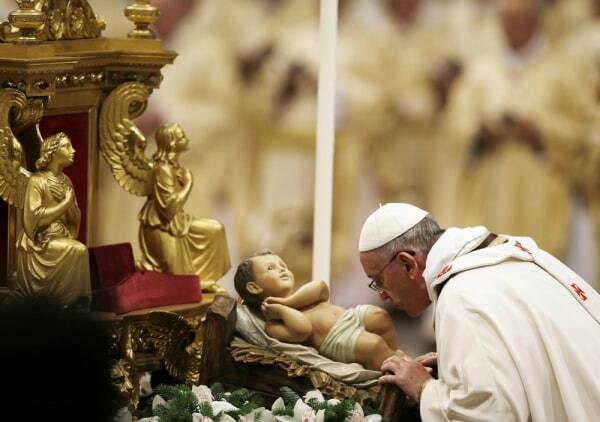 Pope Francis asperges incense on the baby Jesus statue as he leads the Christmas night mass in the Saint Peter's Basilica at the Vatican December 24, 2013. (Reuters) - Pope Francis, celebrating his first Christmas as leader of the world's 1.2 billion Roman Catholics, on Tuesday urged people to shun pride and selfishness and open up their hearts to God and their fellow man. Francis, who last March became the first non-European pope in 1,300 years, celebrated a solemn Christmas Eve Mass for some 10,000 people in a packed St. Peter's Basilica as hundreds of others watched on mega-screens in the square outside. The great bells of the basilica, the same that rang to announce his election on March 13, sounded when the Sistine Chapel Choir intoned the Gloria, a prayer which starts with the words the Bible says angels sang on the night Jesus was born in Bethlehem. Francis delivered a short homily that was as simple as his white vestments: Man can choose between darkness and light. The majority of the Holy Father’s message was taken up with the theme of “Peace to mankind.” Pope Francis reminded us that “true peace . . . is not a balance of opposing forces,” a façade hiding conflicts and divisions. Rather “peace calls for daily commitment . . . starting from God’s gift, from the grace which He has given us in Jesus Christ. "To you, dear brothers and sisters, gathered from throughout the world in this Square, and to all those from different countries who join us through the communications media, I offer my cordial best wishes for a merry Christmas! "On this day illumined by the Gospel hope which springs from the humble stable of Bethlehem, I invoke the Christmas gift of joy and peace upon all: upon children and the elderly, upon young people and families, the poor and the marginalized. May Jesus, who was born for us, console all those afflicted by illness and suffering; may he sustain those who devote themselves to serving our brothers and sisters who are most in need. Happy Christmas!" From the new year a handful of Romans will be invited to celebrate morning mass with the pope inside the Vatican. The 77-year-old pontiff is well-known for embracing the young, old and disabled when they gather in St Peter’s Square, or picking up the phone to make personal calls to individuals or families in distress. As the pope is also formally recognised as the bishop of Rome, he will have the chance to get to know the Catholics closest to him. In another first, around 30 people will be selected from Rome parishes chosens on a rotational basis to attend mass in the intimate chapel inside the Santa Marta residence where the pontiff lives next to St Peter’s Basilica. He celebrates mass there every morning but this is the first time members of the public will be invited to share the pope's daily ritual on a regular basis. (Vatican Radio) It has been confirmed by the Director of the Holy See Press Office that parishioners of Roman parishes will soon be attending Mass with Pope Francis in the Casa Santa Marta. Responding to Italian press reports over Christmas, Fr. Federico Lombardi, SJ, said beginning in January the Cardinal Vicar of Rome will be informing pastors how to apply to attend the Pope’s daily Mass with a group from their parish - probably about 25 people. (Vatican Radio) Benedict XVI, the Pope Emeritus, joined Pope Francis for lunch today at the papal residence at Casa Santa Marta. Earlier this week, Pope Francis had paid a visit to his predecessor (pictured) to offer his Christmas greetings. It was during that visit that Pope Francis invited Benedict to Casa Santa Marta for a holiday meal. When the Pope visited Benedict XVI at his Vatican residence, they got to catch up just like old friends. They met for about 30 minutes, but there was still lots more to talk about. That's why during that brief get-together, Pope Francis invited Benedict XVI to lunch. On Friday afternoon, Ratzinger made a short trip to Casa Santa Marta to have lunch with the Pope. At age 86, this is actually the first time Benedict XVI has publicly gone to the Pope's residence to meet him. Usually it's Pope Francis who goes out to visit him. In the past, Pope Francis has publicly said he enjoys having Benedict XVI around the Vatican, describing him as a wise grandfather. COLUMBIA, MO. — The selection of a reform-minded Argentinian as the new leader of the world’s largest religious institution was voted the Top Religion Story of the Year by the nation’s religion journalists. Members of the Religion Newswriters Association chose as the No. 1 Religion Story of the Year the election of Jorge Mario Bergoglio, who took the name Pope Francis. Pope Francis’ predecessor, Pope Benedict XVI, was in the No. 2 spot because of his historic resignation. -- New Cardinals: Pope Francis is scheduled to create new cardinals Feb. 22. By that time, no more than 106 members of the College of Cardinals will be under the age of 80 and thus eligible to vote in a conclave to elect a new pope. Under rules established by Pope Paul VI, the college should not have more than 120 such members, though subsequent popes have occasionally exceeded that number. So Pope Francis can be expected to name at least 14 new cardinal electors. The election of the first Latin American pope has raised expectations of greater geographical diversity among cardinal electors, so the new slate might prove relatively heavy on names from statistically underrepresented regions, especially Latin America and Africa. -- Vatican reform: The eight-member Council of Cardinals that Pope Francis formed to advise him on governance of the universal church and reform of the Vatican bureaucracy has already joined him for two rounds of meetings at the Vatican and will do so again in February. The body is working on the first major overhaul of the Roman Curia, the church's central administration at the Vatican, since 1988. Although the council has not announced a timeline for its work, Pope Francis has established a record of acting fast; in December, he approved an idea for an international commission on the sexual abuse of children just one day after the council proposed it. So few will be surprised if the council gives him a draft of an apostolic constitution reorganizing the curia before the end of 2014. -- Canonization of two popes: The double canonization ceremony of Blessed John XXIII and Blessed John Paul II, scheduled for April 27, is almost certain to draw crowds larger than the more than 1 million who attended the latter's beatification in May 2011. (Vatican Radio) Pope Francis issued a message through his Secretary of State, Archbishop Pietro Parolin, to the 25,000 young adults participating at the 36th annual European encounter of the Taizé community. The meeting begins on Saturday and this year is being held in Strasbourg, France. In the message, Archbishop Parolin spoke of the closeness the Pope feels to the young adults gathered for the meeting. He spoke of the region as “a land lacerated by wars, which had innumerable victims, but a land that also brings great hope, that of the building of the European family”. “Europe, which has lived and continues to live difficult moments, needs your commitment, your faith, your courage,” he wrote. Addressing the theme of the gathering—“Seek the visible communion of all those who love Christ”—he recognized that the young adults “are aware that the division among Christians constitutes an huge obstacle for the realization of the mission that was entrusted to the Church” and that the credibility of the Christian message would be much greater if Christians could overcome their divisions. (Vatican Radio) A delegation from the Syrian government met on Saturday morning with the Vatican Secretary of State, Archbishop Pietro Parolin, and Archbishop Dominique Mamberti, Secretary for Relations with States. According to a statement issued by the director of the Vatican Press Office, Fr. Federico Lombardi, “the delegation brought a message from President Assad for the Holy Father and explained the position of the Syrian government”. (CNN) -- In a message to Pope Francis, Syrian President Bashar al-Assad said his government is ready to participate in next month's peace talks but noted outside countries must stop supporting what he called terrorist groups in the country's civil war, Syria's state-run news agency said Saturday. "The message also highlighted that stopping terrorism requires having the countries which are involved in supporting the armed terrorist groups stop providing any sort of military, logistic or training support, noting that this support was provided by some of Syria's neighbors and other known countries in the Middle East and abroad," SANA said. The Syrian president's message said that "the crisis will be solved through national dialogue among the Syrians and under a Syrian leadership without foreign intervention as to enable the Syrians to determine their future and leadership through ballots." Parolin told Sweid that the pope "is constantly following the situation in Syria" and "Pope Francis affirms the need to solve the crisis in Syria through dialogue among the Syrians without foreign intervention," SANA said. -- Feb. 11: Pope Benedict XVI announces that he will become the first pope in more than 600 years to resign. -- Feb. 25: Cardinal Keith O'Brien of Scotland, under accusation of "inappropriate conduct" with priests, announces that he will not vote in the upcoming papal conclave. -- Feb. 28: On his last day in office, Pope Benedict flies to the papal summer residence at Castel Gandolfo in a spectacular helicopter ride televised around the world. 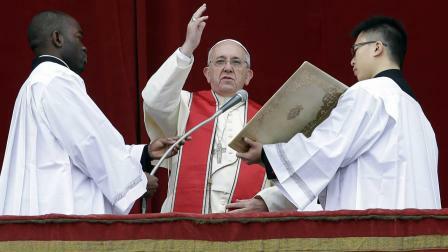 -- March 13: Cardinal Jorge Mario Bergoglio of Buenos Aires, Argentina, is elected pope. The first pope from the Americas and the first Jesuit to hold the office, he is also the first to take the name Francis. -- March 26: The Vatican announces that Pope Francis will not move into the papal apartments in the Apostolic Palace but remain in the Vatican guesthouse, where he stayed during the conclave. -- May 2: Retired Pope Benedict returns from Castel Gandolfo and moves into a refurbished monastery within the Vatican walls. (Vatican Radio) Pope Francis on Sunday invited the faithful to join him sprititually in prayer for the upcoming Concistory and for the next Synod of Bishops which will focus on the theme of the Family. Vatican City, Dec 29, 2013 / 05:26 am (CNA).- In his Angelus address given on the feast of the Holy Family, Pope Francis prayed especially for the approaching Synod of Bishops which will discuss pastoral challenges to the family. The Pope dedicated his Angelus message to considering Jesus’ own family as an example for families everywhere. “God wanted to be born in a human family, he wanted to have a mother and a father, like us,” he explained. Page created in 6.234 seconds with 19 queries.